Were you looking for Florida Premises Liability lawsuits? Premises Liability means that owners and occupiers of property are legally responsible for accidents and injuries that occur on their premises—or property. Liability varies from state to state; for instance, a Los Angeles premises liability lawyer can advise you on the legal rules and principles regarding California dog bite law or California slip and fall law. A Los Angeles dog bite attorney or Los Angeles construction lawyer can best advise you on these specific premises liability California issues. Send your Los Angeles Premises Liability claim to a lawyer who will review your claim at NO COST or obligation. Premises liability covers accidents caused by "slip and fall', dog bites, faulty construction and more, where the owner and/or occupier of the property is held legally responsible for accidents and injuries that occur on that property. Premise liability claims vary from state to state. 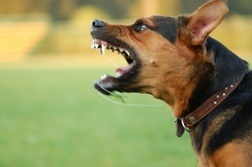 For instance, California dog bite law may focus on the status of the injured party; municipal liability laws regarding Los Angeles dog bites may differ from those laws in Orange County. An LA dog bite attorney could best advise you on both state and municipal laws. 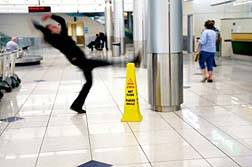 The same premise holds for California slip and fall or any other California premises liability. For example, a California construction accident attorney works closely with city safety inspectors and can advise you on a premises liability California claim. Invitees enter a premises intending to do business or for commercial reasons, such as shopping at a store, or eating in a restaurant. Licensees enter a premises for non-business reasons with the consent of the possessor, like a friend visiting your home. Trespassers do not have permission to enter a premises. The liability burden is dependent upon what type of visitor is injured by the accident. Business owners must provide a safe environment for their customers, and they are held to the fullest burden by premises liability law. Not only must they provide a safe environment for their customers, they are also liable for injuries to visitors if they knew about a potential hazard that caused the injury and failed to notify the customer, and also if they should have known about the potential hazard. Homeowners could be held liable if a visitor slips and falls at their home on a broken step, bad flooring, or an icy driveway, if the homeowner knew about the problem, failed to rectify it, and failed to tell the visitor about the hazard. Trespassers must prove that the home or business owner knew about their presence when the injury occurred. In California, all injury cases are covered by the comparative fault law, meaning that an injured person's legal damages will be reduced by a percentage that is equivalent to his or her fault for the incident. For instance, if a court determines that an injured person is 50 percent liable for their accident and the damages total $10,000, that person will only receive $5,000. If you suffer a serious premises liability injury, you should seek help from a Los Angeles premises liability lawyer. You will need medical attention and you may have to reimburse your own health insurance company for treatment provided from your settlement. A qualified Los Angeles dog bite attorney, or a Los Angeles slip and fall lawyer can help negotiate with your insurance company. You may get a huge bill asking for reimbursement after your case is settled or you may be unaware of liens; a California construction accident lawyer can protect your future. Slip and fall claims are common in California. Even though they may be accidental, owners or property occupiers can be held liable for the damages caused by these accidents. Slip and fall accidents include injuries involving: Stairs; sidewalks, paths, and parking lots; Elevators and Escalators; snow and ice accidents. They can occur in retail stores and other business establishments. A few California slip and fall accidents that resulted in settlements include a recent slip and fall injury in Los Angeles was caused by water spilled on a supermarket floor and another by salt spilled in supermarket aisle. A premises liability settlement in Orange County was reached due to an injury caused from walking onto an oil spill at a car company. Dog bites can cause serious injuries, from head trauma to spinal cord injuries. In most cases, an experienced Los Angeles dog bite attorney will be able to establish that your dog bite injury was the fault of the dog owner, so comparative fault is not an issue. California dog bite law takes into consideration whether the dog is contained or if it is on a leash, if the owner is responsible, if the dog is not properly registered or vaccinated. Dog bite liability suits can also involve an owner having vicious guard dogs on the premises. A California construction accident can occur if you fall on broken concrete, or your heel catches on a piece of carpet and there isn't enough light for you to see the hazard. There are a lot of old buildings in and around Los Angeles; a lot of structures and sidewalks were built in the 1920s and in many instances the city has failed to maintain the properties, causing a big trip hazard. A city such as Los Angeles-- or in some instances the state of California--is supposed to keep sidewalks and streets in hazard-free condition. Sometimes street lights are not working in stairways of public buildings or apartment complexes. There are certain safety regulations in place to ensure sufficient lighting illuminates your pathway. Experienced California construction accident lawyers work with safety and building code experts who inspect building conditions, from how stairs are manufactured to whether or not they are deemed safe. They can determine whether you have a faulty construction case. Premises liability lawsuits cover a wide range of injuries incurred on public or private property. In addition to the above, premises liability can include failure to provide adequate escape routes or fire exits in the event of a fire thereby causing patrons or visitors to be trapped inside; failure to provide adequate security resulting in attack or injury; exposure to toxins or deadly chemicals on someone else's property; roof collapse or deck collapse; faulty escalators in shopping malls that lead to injury. In colder climates, failure to clear away or shovel snow or to salt or de-ice icy areas in order to allow pedestrians to walk safely can lead to premises liability injury. Many injuries that occur on someone else's property become premises liability lawsuits. The bottom line: You have the right to be safe from injury due to hazardous conditions, both on public and private property. If you have suffered an injury, you may be able to recover compensation from the owner or occupier of the property where your injury occurred. Dodgers Seek Dismissal of Los Angeles Premise.. Premises Liability Lawsuits: Dog v. Dog and W..
Trench Collapse Could Lead to Need for Los An..
daughter missed a couple days of school and was unable to write or use her hand for almost a couple weeks. She suffered excruciating pain and discomfort for several days. We took her to the doctor and he prescribed her medication and a school note.